For the past several weeks, I’ve had a survey on Because Pets Can Have Specialists Too asking about what you want to know more. Well you requested and I’ve responded! You wanted to know more about kidney diseases in dogs and cats so this week I’m giving you a post about one of the most common kidney diseases – chronic kidney disease or CKD. Happy reading! Chronic Kidney Disease – What is it? Dogs and cats have two kidneys that help filter metabolic waste products and make urine. The functional units of kidneys are called nephrons. As dogs and cats age, nephrons progressively degenerate. Approximately 33% of cats and 10% of dogs will develop chronic kidney disease, and it is a leading cause of death in both species. Nephrons gradually lose function, making it more challenging for them to perform their vital metabolic duties. The body is always making waste products, and these circulate to the kidneys to be filtered into urine for elimination. Properly functioning kidneys produce a highly concentrated urine so a large amount of toxins can be excreted quickly in a relatively small volume of fluid. Nephrons cannot naturally regenerate, and thus when they’re gone, they’re gone! When enough nephrons are lost, dogs and cats manifest a variety of clinical signs, including increased frequency of urination, increased thirst, and weight loss. With progressive nephron loss, kidneys are no longer able to appropriately concentrate urine. This means the body loses more water when eliminating metabolic toxins, and dogs and cats subsequently drink more water in an attempt help the kidneys. 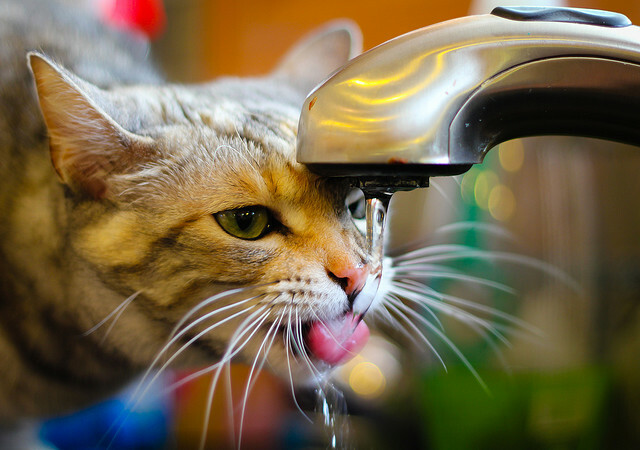 As progressively more nephrons are lost, affected pets will not be able to drink enough water to prevent the blood levels of metabolic waste products from rising. Chronic Kidney Disease – How is it diagnosed? Biochemical profile (CHEM): a non-invasive blood test that measures important kidney values like blood urine nitrogen (BUN), creatinine (CREA), and phosphorus (PHOS), as well as various electrolytes like sodium, potassium, and magnesium. Urinalysis (UA): an often-overlooked but profoundly important non-invasive urine test that gives information about the kidneys’ abilty to concentrate urine, as well as preliminarily assesses the the potential for excess protein, blood, white bood cells and/or bacteria in the urine. Urine culture (UCS): Patients with chronic kidney disease are predisposed to bacterial urinary tract infections (UTI) because the kidneys can’t properly concentrate urine. A UCS is the best way to definitively screen for UTIs. Urine protein:creatinine ratio (UPC): Excess protein loss in the urine has been shown to have negative prognostic significance in both dogs and cats. This test quantifies the amount of protein in urine. Blood pressure (BP): Similar to excess urine protein, high blood pressure (called hypertension) in patients with chronic kidney disease is associated with poorer outcomes. Measurement of BP is absolutely essential for any patient living with CKD. Parathyroid hormone (PTH): This hormone regulates calcium and phosphorus levels in the body. Patients with chronic kidney disease frequently develop a syndrome called renal secondary hyperparathyroidism, a state of elevated PTH induced by CKD. Excess PTH appears to be able to cause damage to nephrons, and prevention of renal secondary hyperparathyroidism may help slow down the progression of CKD in dogs and cats. Symmetric dimethylarginine (SDMA): Symmetric dimethylarginine is made by every cell in the body, is released during protein breakdown, and is excreted almost exclusively by the kidneys. Recent research has shown measurement of SDMA can identify chronic kidney disease in cats and dogs much earlier than traditional values – 17 months and 9 months earlier, respectively. There are multiple stages and substages of chronic kidney disease that have been developed by the International Renal Interest Society (IRIS), and stage of disease may have important prognostic significance – please see Tables #1-3 for more information. Thus the results of the tests listed above not only help veterinarians determine the most appropriate treatments for patients with CKD, but may also give information about how well one can expect an affected pet to fair. Occassionally the diagnosis of chronic kidney disease is not straightforward. Concurrent diseases like Cushing’s disease in dogs and diabetes mellitus in dogs and cats can have some similar signs. Partnering with a board-certified veterinary internal medicine specialist can be invaluable for coming up with an efficient and cost-effective diagnostic plan. Chronic Kidney Disease – How is it treated? Patients living with CKD often need several different medical interventions to help slow the progression of the diease. Not every patient with chronic kidney disease requires the proverbial kitchen sink, and the degree of intervention escalates with progressive stage of disease. Your family veterinarian and a board-certified veterinary internal medicine specialist can partner with you to develop the most appropriate management plan for your pet. Below I have detailed some of the common treatments for patients living with CKD. Nutrition: Patients living with stage 2 or higher CKD benefit from a diet with some unique characteristics, including an appropriate amount of highly digestible protein that yields little metabolic waste, a low phosphorus level and supplementation of omega-3 fatty acids. These foods are typically prescription diets, and many pet food companies (i.e. : Royal Canin, Hill’s, Purina, etc.) have spent millions of dollars on high-quality research to develop appropriate ready-made formulas for patients with CKD. Alternatively pet parents may chose to cook a home-prepared diet for their fur babies; when appropriately formulated by a board-certified veterinary nutrition specialist, these diets can be very healthy. As CKD progresses, patients’ appetites will decline, and they may no longer wish to eat the ideal kidney-friendly food. 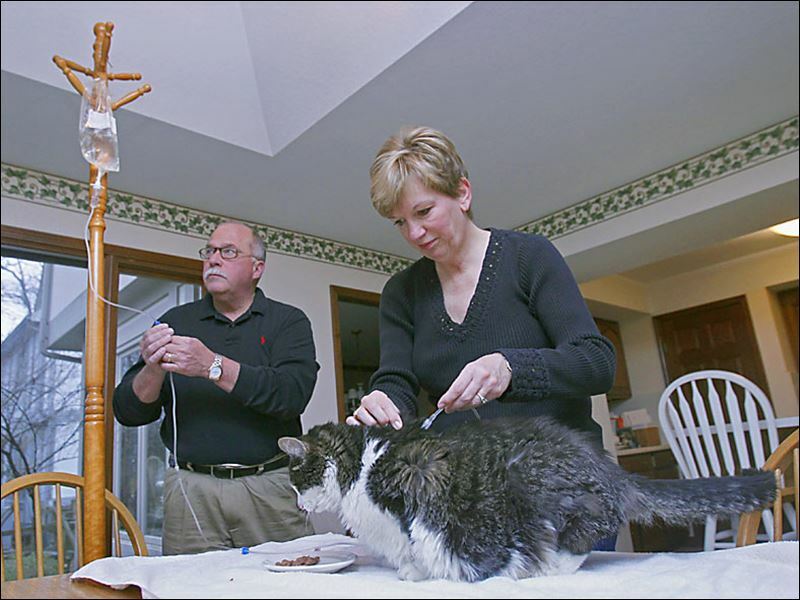 When this time comes, one can simply feed any dog/cat or home-prepared food the pet is willing to eat or a veterinarian can place a supplemental feeding tube (i.e. : percutaneous endoscopically-placed gastrostomy/PEG tube) through which families can provide adequate nutrition. Subcutaneous Fluids: As I discussed earlier, patients living with chronic kidney disease urinate large volumes of urine and subsequently drink more to compensate for their increased urine output. However often this compensatory increased thirst is insufficient and thus patients with stage III disease or higher (and some with stage II) benefit from periodic administration of fluid under the skin at home – this is called subcutaneous fluid therapy. Click here to learn more about this treatment. High Blood Pressure Treatment: Many dogs and cats with CKD develop high blood pressure (called hypertension), and uncontrolled hypertension has been associated with poorer outcomes in both dogs and cats. Click here to learn more about the importance of controlled hypertension in dogs and cats. Thankfully many medications (i.e. : benazepril/Lotensin®, enalapril/Enacard®, amlodipine/Norvasc®) are available to treat this common complications of CKD, and your pet’s medical team can help guide you regarding appropriate anti-high blood pressure therapy. Excess Urine Protein Therapy: Some patients with chronic kidney disease leak excessive amounts of protein in their urine, and this has been consisently shown to be associated with poorer outcomes in both dogs and cats. Medications (i.e. : benazepril/Lotensin®, enalapril/Enacard®, losartan/Cosar®, spironolactone/Aldactone®) are available help reduce the amount of protein lost in urine in an effort to slow down progression of this disease. Phoshorus Control: Blood phosphorus levels frequently elevate in patients with CKD. As I mentioned earlier, kidney-friendly diets are formulated with reduced amounts of phosphorus. However sometimes this dietary restriction simply isn’t enough, and therefore some patients need additional medications (i.e. : aluminum hydroxide, lanthanum carbonate/Renalzin®, calcium carbonate/Tums®, Epakitin®) to help reduce absorption of phosphorus from ingested food. Potassium Supplementation: By this time you know patients with chronic kidney disease urinate larger volumes, and this urine often contains meaningful amounts of potassium. Potassium is an exceedingly important electrolyte in the body, and when the level is low, several side effects are possible, including loss of appetite, decreased activity level, and inability of pets to their their head (particularly in cats). Dietary potassium supplementation recommended for those pets with consistently low blood potassium levels. A cat with low blood potassium that can’t raise its head. This is called cervical ventroflexion. Stomach Acid & Nausea Control: As the kidneys aren’t functioning properly, some chemicals normally excreted by the kidneys circulate in the bloodstream longer than normal to cause the stomach to produce more acid. The result? Nausea, vomiting, and a reduced appetite. Click here to learn more about some of the ways dogs and cats tell us they’re nauseated. While they are not anti-nausea medications, antacids (i.e. : omeprazole/Prilosec®, famotidine/Pepcid-AC®, raniditine/Zantac®, cimetidine/Tagament®) may be recommended for pets living with chronic kidney disease to reduce the negative effects of excess stomach acid. Similarly since excess stomach acid can directly cause nausea and/or vomiting, some patients with CKD benefit from aggressive anti-nausea medication (i.e. : maropitant/Cerenia®, dolasetron/Anzemet®, ondansetron/Zofran®, metoclopramide/Reglan®). Control of Excess Parathyroid Hormone: Excess parathyroid hormone appears to contribute to the progression of CKD in dogs and cats. Therefore therapy with a medication called calctriol to reduce an elevated parathyroid hormone level is likely beneficial in patients with chronic kidney disease. Furthermore there is some evidence treatment before parathyroid hormone levels become elevated may be helpful. Anemia Therapy: The kidneys produce a hormone called erythropoietin (EPO) that travels in the bloodstream to the bone marrow to stimulate production and release of red blood cells from the bone marrow. As CKD progresses, the kidneys ability to produce EPO diminishes to a level that not enough red blood cells are circulating in the body – this is often called anemia of chronic kidney disease. When pets’ bodies can no longer adequately compensate for anemia induced by CKD, they often benefit from treatment with hormone supplementation (i.e. : darbepoieten/Aranesp®; epoetin alfa/Epogen®). Chronic Kidney Disease – What’s the prognosis? The general prognosis for dogs and cats living with CKD is guarded, and those with lower stages of CKD tend to have longer survival times than those living with higher stages. Excess urine protein, elevated blood phosphorus, and high blood pressure are associated with worse prognoses in both dogs and cats, and thus these issues should be identified and effectively addressed as quickly as possible. Chronic kidney disease is a common ailment of older dogs and cats. While the disease is not reversible and is slowly progressive over several months to years, there are several possible interventions to help slow the progression of the disease. Partnering early with your family veterinarian and board-certified veterinary internal medicine is key to maximizing an optimal response so pets can live the highest possible quality of life for as long as possible.